Havyard shipyard announced that it received a contract to build seven battery-powered ferries for Fjord1, Norwegian transport conglomerate. Havyard will be delivering the design for seven battery-powered ferries to Fjord1, five of which will be built at the company’s own shipyard. Havyard and Fjord1 will thereby continue their partnership to achieve a green revolution on the Norwegian fjords. The news comes after the operators of the first all-electric ferry in Norway, the Ampere, reported some impressive statistics after operating the ship for over 2 years. They claim that the all-electric ferry cuts emissions by 95% and costs by 80%. All the ferries for Fjord1 must meet stringent requirements for low energy consumption during tough weather conditions. The ferries will be used by Fjord1 to operate ferry services in Hordaland and Møre og Romsdal, starting on 1 January 2020. The construction contract applies to five 50-car ferries which will operate in the Langevåg-Buavåg and Fedje-Sævrøy in Hordaland, and one on Kvanne-Rykkjem and and two at Edøya-Sandvika in Nordmøre. The design contract of the two 80-car ferries will operate in Seivika-Tømmervåg in Nordmøre. 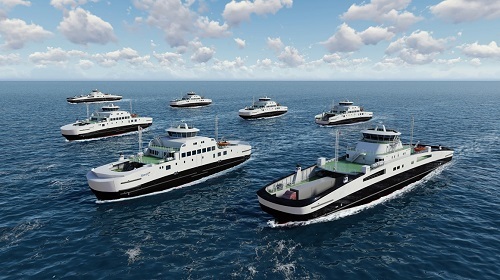 Fjord1’s modernisation of the fleet is unique in the global context and is a result of the company winning a number of tender competitions where minimum emission requirements had to be met. The Norwegian authorities have demanded zero-emission technology solutions as part of the effort to reduce emissions from the ferry fleet, which has taken Norway to the forefront of developments in the field.